This November sees The EFG London Jazz Festival return to the capital for a 10-day celebration of jazz with the likes of Pat Metheny, Moses Boyd, Manu Dibango & The Soul Makossa Gang and many more all set to play across a number of venues in the city. Another of those acts set to play is Jaga Jazzist, bringing their anything goes blend of jazz, rock, hip-hop, polka and more to London's Southbank Centre with the band appearing as part of a programme showcasing Nordic jazz music. 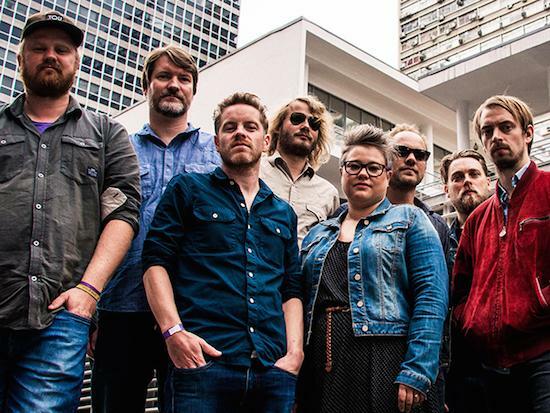 The gig will see Jaga Jazzist appear on a double bill with folk singer Sinikka Langeland who will present the UK premiere of her new album, The Magical Forest, alongside an ensemble featuring instrumental soloists Arve Henriksen and Trygve Seim, as well as the voices of Trio Mediaeval. The gig takes place on November 19 and you can find more information, as well as buy tickets, here. We have three pairs of tickets to give away for the show though, and you can be in with the chance of winning one of those pairs if you email the correct answer to the question below to comps@thequietus.com before the deadline of midday on September 14. The EFG London Jazz Festival runs across multiple London venues from November 10-19. For more information and tickets, click here. When did the first EFG London Jazz Festival take place?